Join in the world’s fastest growing sport. “I am afraid of tipping over!” “I don’t know how to get in or out of a kayak.” Or “It looks like a lot of work and I don’t have strong arms”. Let us put your fears to rest. Come out and spend a morning with us learning how to get in and out of your kayak and different paddling strokes. Once you are comfortable with your kayak and paddling strokes we will go for a group paddle for approximately 30 minutes. Your class will be conducted on Ellicott Creek across from our facility. All instructors are New York State Licensed Guides. Class will run from 9:00 am to 12:00 pm. 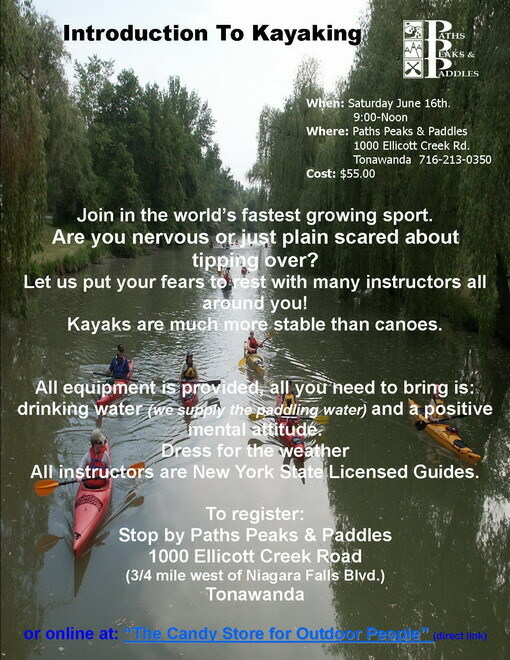 Paths, Peaks and Paddles is located at 1000 Ellicott Creek Road Tonawanda, NY 14150. All equipment is provided. Bring water and a positive mental attitude. We will have you excited about your new found skills in no time!